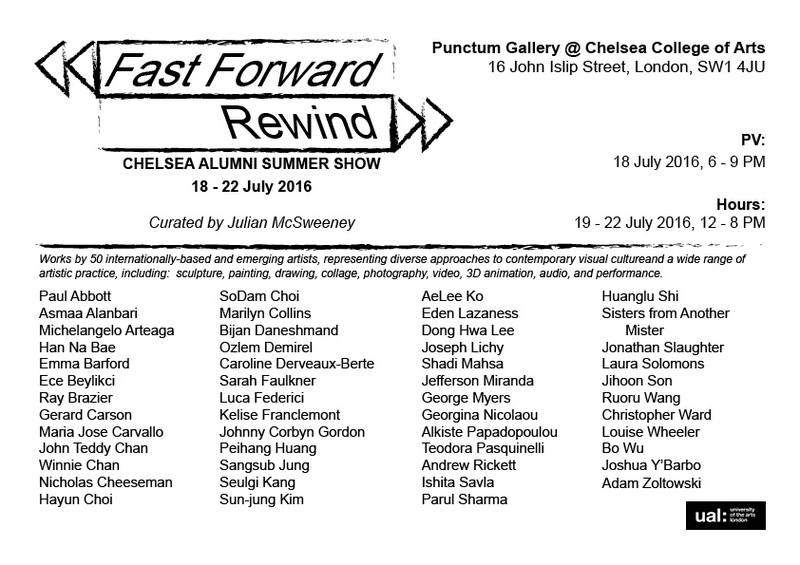 20-second sneak-peek: 50 recent alumni of the MA Fine Art course at Chelsea College of Arts come together again for “Fast Forward/Rewind”, a show curated by 2015 graduate Julian McSweeney. From 18 to 22 July 2016 in the Punctum Gallery @ Chelsea College of Arts, London, private view: 18 July 2016, 6:00 to 9:00 PM. Punctum Gallery at Chelsea College of Arts hosts “Fast Forward/Rewind”, an exhibition of work by 50 internationally-based and emerging artists, representing diverse approaches to contemporary visual culture and a wide range of artistic practice including: sculpture, painting, drawing, collage, photography, video, 3D animation, audio, and performance. Installation view, ‘Fast Forward/Rewind’ at Punctum Gallery, Chelsea College of Arts, London. Photo credit Kelise Franclemont. This dazzling array is curated by Chelsea alum Julian McSweeney, “Fast Forward/Rewind” opens on 18 July 2016 with a private view event, and will also offer a day of artist talks/crits on Thursday 21 July 2016 (both open to the public). If you missed the last year or two of summer shows or if you want to catch up with an artist you’ve already met, “Fast Forward/Rewind” will be a great opportunity to see what’s new from those who have recently completed the MA Fine Art course at Chelsea College of Arts. About MA Fine Art course at Chelsea College of Arts – info, how to apply, and more.